We are super charged with exciting activities, trained teaching artists and relevant, engaging learning experiences. Our educational programs offer a range of activities easily adapted to the needs and interests of middle and high school students and teachers. Our in-studio and in-school programs are hands-on and all classes can be customized to incorporate STEAM, Geometry, History, Literacy, 21st Century Learning and of course visual arts. Through experimentation and creation, students practice teamwork, cooperation and problem-solving skills. ​Contact education@glassroots.org or 973.353.9555 to discuss program content and pre- and post-visit activities, or provide your contact information here and our Program Director will reach out to you. Bring Your Students to GlassRoots! 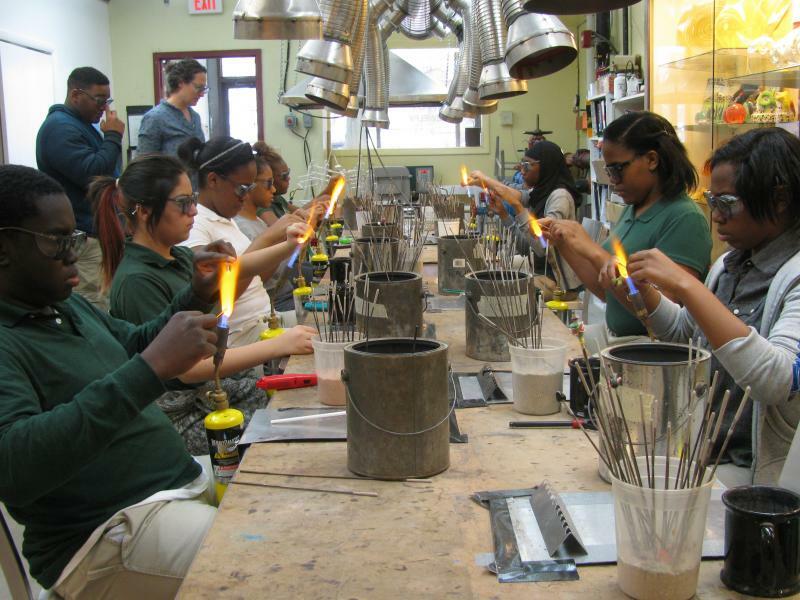 When students come to GlassRoots for field trips they have the opportunity to visit one, two or three studios, known as the Flame Shop, the Flat Shop or the Hot Shop, for hands-on lessons in glass-art making. All glass art projects include an introduction to and practice with glass tools, as well as lessons in basic color and design theory. Lessons incorporate relevant STEAM principles (STEM + art), historical context, and multiple opportunities to practice aspects of 21st Century learning such as teambuilding, problem solving, time management and communication. Field trips are available for students grades 5 and up. Program fees are sliding scale, based on program length and ability to pay. All programs can be customized to include New Jersey State Learning Standards and can include a planning session with our Program Director to connect our glass artwork to a school’s academic curriculum. Students will learn the basics of flameworking, which includes lessons about gravity and viscosity, to create glass beads and small glass objects that can be taken home the same day. Lessons may also include the fundamentals of jewelry design. Starting with the basic knowledge of flat shop tools, including glass clippers, running pliers and scoring knives, students will create an individual mosaic or glass-fused (kilnformed) piece. Instructors will discuss the use of geometric patterns in design and color theory. Flat Shop may also include lessons in printmaking, etching and casting. During a glassblowing demonstration students observe as our master glassblowers create a glass plate or paperweight. Topics covered within this demonstration include viscosity, gravity and centripetal force, among others. Teaching artists will share basic traditional postures, techniques, and forms of blown glass. *Glassblowing lessons are also available for students 14 years and older in small groups of up to three students at a time. Offer your students stimulating and educational experiences by participating in activities at GlassRoots! GlassRoots has a variety of lesson plans ready to adapt to your students' programs. Here are two samples: Glassblowing and Compression Tension. We offer a variety of workshops which align with State Learning Standards in all curriculum areas. Please contact education@glassroots.org or 973.353.9555 to discuss program content and pre- and post-visit activities, or provide your contact information here and our Program Director will reach out to you. Watch our students demonstrate the Prince Rupert's Drop! Please note that school tours must be scheduled at least three weeks in advance. Not all workshops are available at all times. We are happy to provide pre- and post-visit resources to help you prepare your class to get the most from their visit at GlassRoots. The Geraldine R. Dodge Foundation and the Community Foundation of New Jersey established a field trip endowment fund to launch Field Trip New Jersey. For more information, please call us at 973 353 9555 or email us at education@glassroots.org !